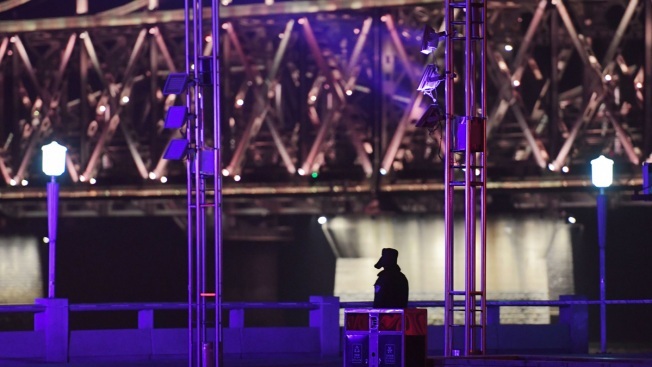 A policeman patrols at the cordoned-off waterfront area near the Sino-Korean Friendship Bridge (top) shortly before the arrival of the armored train of North Korean leader Kim Jong Un, in Dandong in China's northeast Liaoning province, on February 23, 2019. - North Korean leader Kim Jong Un's armored train arrived in China late February 23 ahead of his summit with US President Donald Trump in Vietnam, according to media reports. North Korea leader Kim Jong Un was on a train Sunday to Vietnam for his second summit with U.S. President Donald Trump, state media confirmed. Kim was accompanied by Kim Yong Chol, who has been a key negotiator in talks with the U.S., and Kim Yo Jong, the leader's sister, the North's official Korean Central News Agency reported. Late Saturday, an Associated Press reporter saw a green and yellow train similar to one used in the past by Kim cross into the Chinese border city of Dandong via a bridge. The Trump-Kim meeting is slated for Wednesday and Thursday in Hanoi. Their first summit last June in Singapore ended without substantive agreements on the North's nuclear disarmament and triggered a months-long stalemate in negotiations as Washington and Pyongyang struggled with the sequencing of North Korea's nuclear disarmament and the removal of U.S.-led sanctions against the North. Kim's overseas travel plans are routinely kept secret. It could take more than two days for the train to travel thousands of miles through China to Vietnam. Vietnam's Foreign Ministry announced Saturday that Kim would pay an official goodwill visit to the country "in the coming days" in response to an invitation by President Nguyen Phu Trong, who is also the general secretary of Vietnam's ruling Communist Party. In his upcoming meeting with Trump, experts say Kim will seek a U.S. commitment for improved bilateral relations and partial sanctions relief while trying to minimize any concessions on his nuclear facilities and weapons. Last year, North Korea suspended its nuclear and long-range missile tests and unilaterally dismantled its nuclear testing ground and parts of a rocket launch facility without the presence of outside experts, but none of those steps were seen as meaningful cutbacks to the North's weapons capability. While North Korea has repeatedly demanded that the United States take corresponding measures, including sanctions relief, Washington has called for more concrete steps from Pyongyang toward denuclearization. Hanoi has been gearing up for the summit with beefed-up security. Officials say the colonial-era Government Guest House in central Hanoi is expected to be the venue for the Trump-Kim meeting, with the nearby Metropole Hotel as a backup. Streets around the two places have been beautified with flowers and the flags of North Korea, the U.S and Vietnam. Workers were also putting final touches on the International Media Center. Vietnam's Foreign Ministry says some 2,600 members of the foreign press have registered for the event. Meanwhile, Vietnam has announced a traffic ban along Kim's possible arrival route. The Communist Party's mouthpiece Nhan Dan newspaper late Friday quoted the Department of Roads as saying the ban will first apply to trucks 10 tons or bigger, and vehicles with nine seats or more on the 170-kilometer (105-mile) stretch of Highway One from Dong Dang, the border town with China, to Hanoi from 7 p.m. Monday to 2 p.m. Tuesday, followed by a complete ban Tuesday on all vehicles from 6 a.m. to 2 p.m. The People's Committee in Lang Son province, where the Dong Dang railway station is located, issued a statement Friday instructing the road operator to clean the highway stretch and suspend road works, among other things, on Feb. 24-28 as "a political task."